Dan Olmsted, one of the editors of Age of Autism (the blog full of lies and misrepresentations, and a near-psychotic obsession with trying to link vaccines and conspiracies to anything that happens in the world) has passed away. There must always be honor in the battlefield of ideas, especially from those of us who fight with facts and evidence in our arsenal. So, please, do not celebrate his death. Be respectful of the people who love him and will be heartbroken at his passing. Rest in peace, Dan Olmsted. This is the seventh post that has nothing to do with vaccines, for the most part. “Dr. Tom Insel, who is the nation’s leading expert in funneling funds away from research that seeks to pinpoint causation or could lead to cure, has been pulled from his post as head of the Interagency Autism Coordinating Committee to head up the HeEbeeGeeBee program. In the minds of these people, Ebola is like autism, or autism is like Ebola. When will they stop comparing autistics with sick people, dead people, or worthless people, or kidnapped people? “So the question is: can the PCR test allow researchers and doctors to say how much virus is in a patient’s body? “Already killed thousands Larry? And we should believe this because …. the main stream media is telling is us that it’s so??? Guess what? PCR works. Just because they don’t understand, or want to understand, the science doesn’t mean the science doesn’t work. You don’t screen with PCR for a virus on a healthy individual. Like all lab tests, you assess their risk of being infected and their symptoms. PCR is not used for general screening. It’s a diagnostic lab test. Science denialism cuts both ways, jerks. Walk 2 end Alzheimer’s. Autism is like 70+ yrs of Alzheimer’s 4 many but cure = verboten. The same people who tell us time and time again that death is better than autism is now telling us that autism is like Alzheimer’s disease. Sure, they slapped on the qualifier “4 many,” but how much is many? Too many, sadly. Do I need to compare and contrast these two things? I hope not. How many times can you fit “whore” into a blog post and claim you’re not trying to insult anyone? The Age of Autism people have a credibility and image problem on their hands, if you ask me. On the one hand, they are trying to come off as experts in all things autism and all things anti-vaccine, but, on the other hand, they are offending people left and right. Time after time, they manage to get themselves in hot water with their own readers. Posts go missing. Comments get erased. 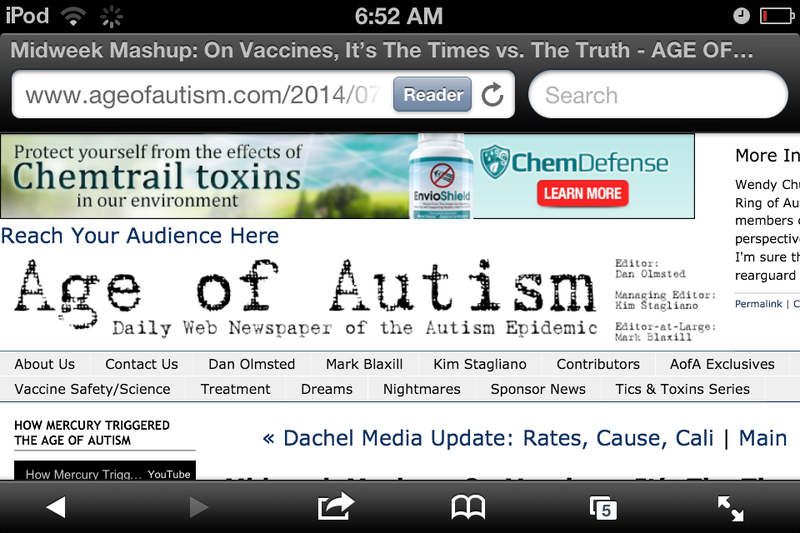 Ah, that “Daily Web Newspaper of the (nonexistent) Autism Epidemic” never fails to entertain me and give me a good laugh. This time, “Tanner’s Dad” (aka Tim Welsh) has written his list of twenty reasons why he questions vaccine safety. Like every good anti-vaccine activist, it is full of misinformation. The casual reader coming upon this list might be tricked into thinking that Tim Welsh has done his homework… That his reasoning is sound. His reasoning is so flawed that I had to laugh. So let’s break down the list one-by-one, shall we? I was talking to a friend who works in a psych unit the other day, and he asked how I was dealing with the anti-vaxxers and other denialists. I told him that it was a little frustrated at times that there are so many people willing to ignore reality for fiction. He told me about a psychological concept called “fiction”. This is not fiction in the traditional sense. This is fiction in that a person has created a sort of reality around them that is real to them, maybe even tangible, even if all the evidence points to the contrary. You have probably seen examples of this in women who go to deliver a child and had convinced themselves all the time that they were not pregnant, even going on public record and saying that they had no clue (never mind the belly, the lack of a menstrual period, and other indicators of what reality was). You also see it too often in men who cheat on their wives and have convinced themselves that what they are doing is not wrong, or that there will be no consequences. My thoughts went to the “Weirdo” John Stone of Age of Autism. He is convinced that I am someone else, someone employed by “Big Pharma”, and that I am in cahoots with a whole bunch of other people who are pro-vaccine. I’ve offered to him to become my “friend” on Facebook and get to see pictures of myself and my family, where I am working, and even my telephone number, but he has not agreed. Why? Because he is convinced that I am “despicable”. That, or he doesn’t want the fiction that he has created about me to be torn down. After all, if I turn out to be just a random guy and not who he thinks I am, there is no more boogeyman, no monster under his bed. In many, and very heated, discussions about vaccines (and even about science in general), public health officials and workers (and anyone in any way associated with the pharmaceutical industry) get compared to the Nazi regime which ruled Germany in the 1930’s and 1940’s. To take in and understand why that analogy is flawed, you have to understand what happened during that time in Europe. I won’t bore you with the history class, but I will tell you that public health working to save the lives of children today is nothing at all like what happened under the Nazi regime. We are not arbitrarily picking children and killing them en masse. We are not tying anyone down and performing medical experiments on them. We don’t believe that one ethnic or religious group is to blame for all of society’s ailments. To be a person of science, and someone who believes in science, we cannot have the luxury of creating fictions around our lives. Sure, we may create mini-fictions to understand why someone like the weirdo or the kid may hate us with such a passion, but we pretty much accept reality for what it is. Personally, I believe the weirdo just has a psychosexual obsession with me, but that’s just me, and I’m no psychologist. That’s a very minor personal fiction compared to what he fantasizes believes about me, maybe. And I’ve told you about his obsession with Dorit Reiss as well. On the contrary, we need to live and accept the evidence and do something about it. Even those among us who believe in a higher power, I’m yet to find a true person of science who falls to their knees and prays instead of taking evidence-based action. So how do you deal with a person or a group who is/are cocooned in their own fiction? With some, it will be just a matter of breaking down that fiction with facts. With others, there will be absolutely nothing you will be able to do. What they see as reality looks, feels, and even tastes like reality, so there cannot be anything else. In the case of the weirdo, it will not matter how many times I explain to him that I am not who he thinks I am, and that I’m not at all interested in him in the way that he seems to think I am interested in him… Which sends shivers down my spine.